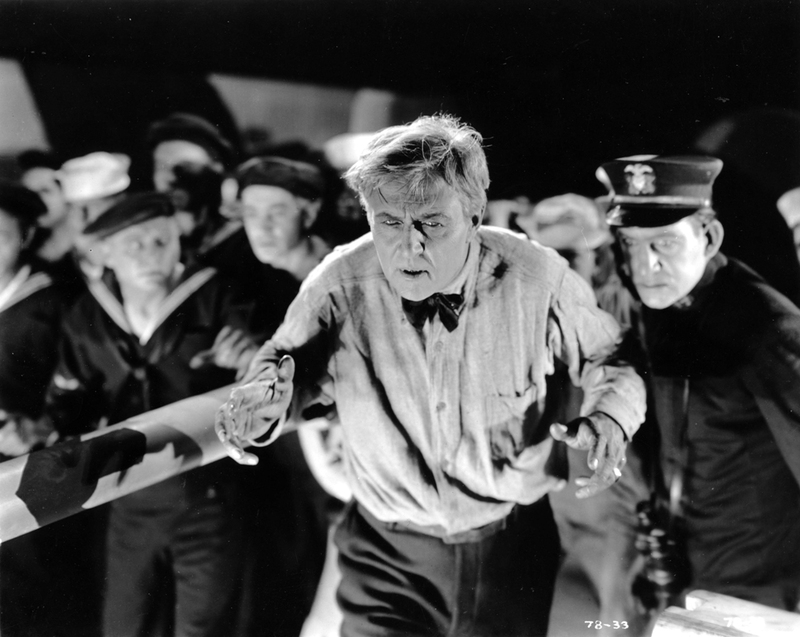 Flicker Alley is proud to present the following essay by Robert M. Fells on the life and career of Hobart Bosworth, star of Behind the Door (1919), available to pre‑order now on Blu‑ray/DVD for release on April 4, 2017. With a name like Hobart Bosworth, you had better be good at whatever you do for a living. It’s one of those names that isn’t likely to be concocted as a stage name, and indeed the hero of our essay was born Hobart van Zandt Bosworth in 1873 in Marietta, Ohio. Standard biographical profiles claim that he was descended from Miles Standish and John Alden paternally, and the Van Zandt family, the first Dutch settlers in New York, maternally. Film buffs will recognize the name as an actor, and sometime star, of silent films and numerous sound films from the 1910s through the early 1940s. But a quick search reveals that Bosworth was much more. His name is connected with the term “producer, director, writer,” and even “painter.” And he seems to have had more lives than a cat. His early stage career was cut short by tuberculosis, usually a death sentence in the late 19th and early 20th centuries. Then his voice began failing, a likely fatal blow to anyone enjoying a successful theatrical career. Bosworth beat TB and when talkies came in he was acclaimed for his beautifully expressive voice. Bosworth was in fact among the unique group of Hollywood Pioneers but unlike his peers D.W. Griffith, Cecil B. DeMille, and Thomas Ince, this accolade always seems to be appended with the word “forgotten” as if somehow it was his fault. Perhaps this is the curse of living a sensible life and being a level-headed individual. Biographies tend not to be written about such people and Bosworth himself never got around to writing his memoirs, perhaps sensing that there was little drama or controversy in his tale. Yet there is quite a story that a first-hand account could have provided. He partnered with Jack London to make a series of films based on his novels beginning with The Sea Wolf in 1913—a seven reel film at a time when American feature films barely existed. Bosworth organized his own production company before the rise of the major studios and functioned as an auteur decades before that term was given to filmmakers. While never considered a cowboy star along the lines of William S. Hart, Tom Mix, or Harry Carey, Hobart Bosworth was probably the only actor to commute on horseback from his home to the studio every day. Bosworth ran away from home as a kid, apparently as a reaction against a nasty stepmother. 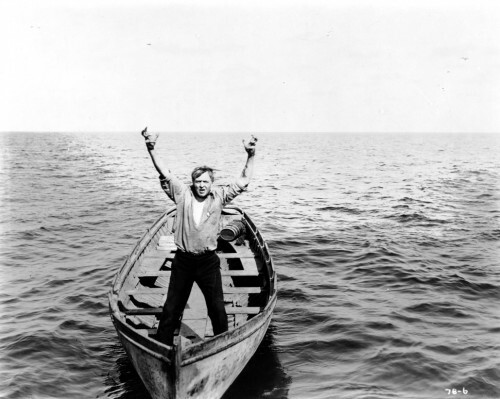 He went to sea as a cabin boy and his love of the sea later found a creative outlet in many of his silent films in the teens. Much of what is known about him has been gleaned from interviews he gave over the years. While skepticism and using the proverbial “grain of salt” in assessing his various accounts are wise, little in his recollections seem particularly inflated or unlikely. He knocked around finding various jobs in his teenage and early adult years, and seems to have been a likeable young man who fostered friendships wherever he traveled. By the late 1880s Bosworth was mixing theater work with being a ranch hand, where he learned horsemanship. He co-wrote a Faust play for actor-manager Louis Morrison that he performed in repertory for the next twenty years. Alternating acting with odd jobs on and off the stage, Bosworth was hired by the celebrated Austin Daly for his New York company where he also toured in Europe for a time. But Daly only gave him small parts, albeit in Shakespearian plays, and young Bosworth grew ambitious for meatier roles. He joined Julia Marlowe’s company and was cast in leading roles in her Shakespeare repertory. But just as he was establishing himself in the New York theater world, tuberculosis struck. Hobart would be plagued by recurring TB for the remainder of his long life but initially he re-established himself on the New York stage by 1903 where he had success in Ibsen’s Hedda Gabler, and the lead in Marta of the Lowlands. However, with the risk of becoming an invalid, he moved to Tempe, Arizona, waiting for the TB to go into remission. By that time the disease also weakened his voice. Was Fate ever going to give this man a break? By his third Selig film, Hobart was writing scenarios and directing many of them. He later said that he wrote 112 scenarios and produced 84 films for Selig. In 1913, he formed the Hobart Bosworth Production Company and teamed with Jack London for stories. Eventually, the Bosworth Company combined with Oliver Morosco Productions and produced 31 films through 1921. It was during this period, the late teens, that Bosworth also hired himself out to appear in other filmmakers’ productions, most notably with Cecil B. DeMille: Joan the Woman [available on MOD DVD], The Little American, and The Woman God Forgot. Bosworth starred in Behind the Door (1919), yet another of his beloved seafaring films. It was produced by the Thomas Ince studio and distributed by Paramount. Bosworth’s company was being absorbed into Paramount as the studio system grew from relatively small businesses to large corporations. The small studios were faced with either expanding, being acquired by larger studios, or going out of business. Many went out of business. Once again, Bosworth landed on his feet amidst the corporate turmoil. His time as a studio head was ended but he likely did not miss the innumerable headaches that went along with the job. For example, as a harbinger of things to come, Hobart was unable to release his first production, 1913’s The Sea Wolf, until Jack London had cleared up litigation that prevented the film from being shown. In his 50s now, Bosworth played supporting roles in a series of important films throughout the 1920s. Today, his film credits include some of the decade’s best films: The Big Parade, Annie Laurie, My Best Girl, A Woman of Affairs, to name only a few. With the death of silent films by 1929, the sound film era created a new chapter in Hobart’s career. For a man who had to retire from the stage because of his poor voice, the talkies revealed him to possess a mellifluous tone with the phrasing control that only a seasoned actor could provide. 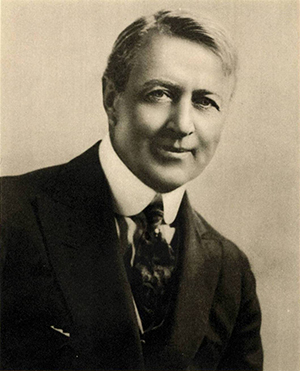 Whenever an authority figure was needed in a film, the studios sent for Hobart Bosworth. Throughout the 1930s, Bosworth did not need a well-scripted part to be convincing. He just needed to show up for the audience to know who was in charge. For Frank Capra’s Lady for a Day (1933), the director needed someone for a small part in one scene to play the governor of New York. He chose Hobart Bosworth who put over the part in less than 30 seconds. Bosworth continued to appear in films up to 1942 when, in his 70s, he finally retired. He married twice; his second marriage began in 1920 and lasted through his death in December 1943. He adopted his second wife’s son from her previous marriage. They lived in a beautiful mission‑style home that today is on the Beverly Hills tour of notable homes. For a “forgotten” pioneer Bosworth has a star on the Hollywood Walk of Fame, and the Hobart Bosworth Papers, comprising some 28.5 linear feet, are housed in the Margaret Herrick Library Special Collections at the Academy of Motion Picture Arts and Sciences. The release of Behind the Door, a “new” Hobart Bosworth film, may well inspire an enterprising author to give this fine gentleman his due. 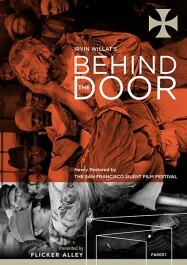 Pre-order Behind the Door on Blu-ray/DVD now for 25% OFF for a limited time! Release date: April 4, 2017.